If you are looking for a mouth-watering meal, and you love BBQ, we have found another great place! Famous Dave’s has won over 700 awards and you will understand why after you taste their delicious food! Their pitmasters get their hickory logs smoldering around 4 a.m. They start with top quality meats, hand-rub them with fresh spices, and slow-cook them to perfection. 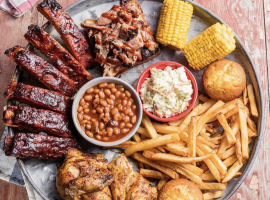 One of their featured favorites is the “Feast for Two-sday.” Their Feast for 2 is served family-style, including hearty portions of St. Louis-Style Spareribs, Country-Roasted Chicken, Georgia Chopped Pork, Creamy Coleslaw, Famous Fries, Wilbur Beans, Sweet Corn and Corn Bread Muffins. A feast sure to satisfy anyone’s hunger. The best part..it’s only $29.99 on Tuesdays! Other menu favorites include: country roasted chicken, Texas beef brisket, sweetwater catfish, Georgia chopped pork sandwich, burgers, wings, loaded baked potatoes, and more. You’ll definitely want to save room for desserts like award-winning bread pudding, banana pudding, ice cream, and brownies! If you need an event catered, Famous Dave’s can help with that as well! They’ll take care of everything and the only thing you’ll have to do is enjoy the food! Famous Dave’s is located at the Branson Landing. Take time to enjoy a delicious dinner with your family and friends and head over for lunch or dinner now!